What happens when a government creates billions of dollars out of thin air and goes trillions of dollars into debt? Banks go under... financial institutions fail... hedge funds implode... the dollar plunges in value... and the economy teeters on the brink of collapse. Sound familiar? Special Offer! 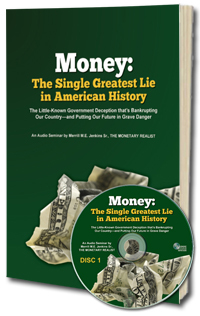 Get this book PLUS The Great Money Myth for only $79.95. Click Here!